This weekend was pretty much a bust as far as making any kind of significant progress on my “to do” list for this month. Part of that was beyond my control. I usually take Fridays off, but I worked this past Friday because the weather was beautiful and I knew rain was coming our way on Saturday. I didn’t want to let a gorgeous day filled with sunshine go to waste, so I got some more sanding and spraying done on the cabinet doors. On Saturday, my plan was to take the new paint color I mixed to Benjamin Moore and have them mix up another gallon, since I’m pretty sure my kitchen will take more than one gallon. I wanted to have both gallons of paint on hand so that I could mix them together, and then get started on all of the indoor painting. But the two people at Benjamin Moore worked for over an hour to get the color matched, and just couldn’t get it right. Then their power went out, so after an hour and fifteen minutes of waiting, I went home empty handed. All of that was beyond my control, and those are things that we DIYers have to deal with on every project, right? It just comes with the territory. But the rest of the things that kept me from making progress were well within my control. I’m glad this weekend happened, because it really helped me to recognize bad habits and how I tend to get lost on rabbit trails rather than just follow through in my initial goal. Mine will be a little different because I’m not going to put doors on mine with storage behind. I’m only five feet tall, and I’ve never once used the cabinets above my stove to store anything. So I’m okay with losing those tiny cabinets. But I do want to do something to capture this overall look. That part was fine. Building the range hood cover is on my list of things to do for this month. But then I got to thinking about my refrigerator. I want to get rid of my refrigerator/freezer combo and get an all refrigerator in its place. And since I’m going to be building a range hood cover, shouldn’t I also go ahead and purchase my new refrigerator just in case that compartment needs some adjustments? That way I can do all of my building at the same time before I start painting that section. Matt said I could go ahead and buy it. But then if I’m getting rid of our refrigerator with the freezer, then I’ll also need a freezer. Before I knew it, I had planned about $5000 worth of new appliance purchases just because in the future, I might need to raise the shelf in the refrigerator compartment and I thought it needed to be done right now. And that’s $5000 that would come out of the money that we have budgeted for immediate use on my studio, which means that I would be spending money replacing perfectly good appliances and delaying getting started on my studio. But my madness didn’t end there. Those appliances are stainless steel. Y’all know how I feel about stainless steel. I’m coming around on it just a bit, but I’m still not fully there. The stove also comes in black, but the refrigerator doesn’t. So then I started wondering if black might be better. 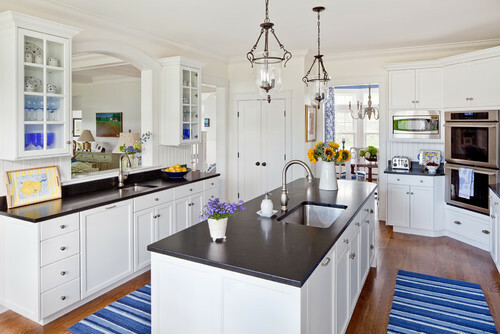 I got onto Houzz and Pinterest to see if I could find any teal or blue kitchens with black appliances. And if I got black appliances, would I also need a black sink and faucet? How does a black sink with a black faucet look on a white countertop? I’d need to look at pictures and see how that looks. Or would those be stainless steel? Or would I stick with a white sink and a stainless faucet like I have now? 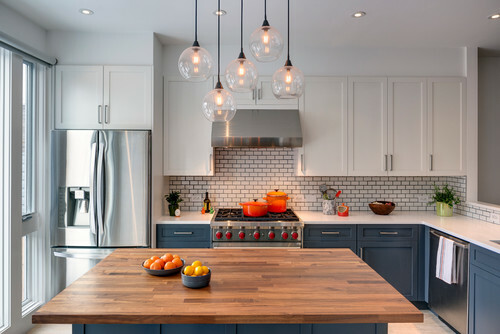 I couldn’t find an example of black appliances with blue or teal kitchens, but in looking through blue kitchens, I did come across this beauty. And then I totally started second-guessing my “all one color” plan. Should I paint my uppers white? I mean, that looks so light and bright and beautiful! And I could also incorporate some open shelves made of wood, because you know how much I love wood! And then I could do the wood vent hood, which was really my favorite of the three, but it just didn’t seem to go in my kitchen. But if I have the wood shelves, it would make more sense. But where would I put the wood open shelves? In my kitchen, the only place for them would be on the range wall flanking the range hood. 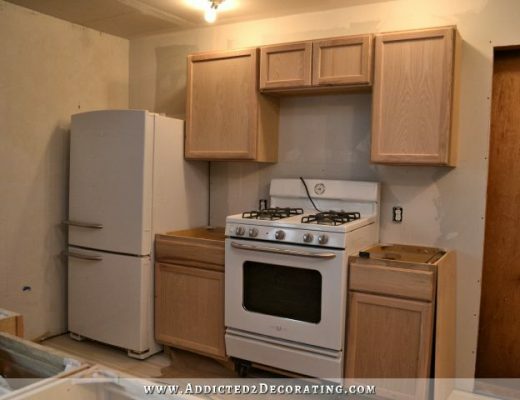 So if I removed those cabinets and opted for wood open shelves, how exactly would the two-tone paint work? Generally in a two-color kitchen, the refrigerator compartment is painted the color of the upper cabinets. But that’s generally because it has upper cabinets actually connected to it. If I remove the upper cabinets flanking the range hood on that wall and opt for wood open shelves, then I’ll just have a stand-alone refrigerator compartment painted white next to teal lowers. I could paint it teal, but then the only white cabinets in the room will be the white uppers on the wall of cabinets, which will be weird. And then, what if I decide to open up the center section of that wall when we do our big addition so that there’s a pass through from the kitchen to the new family room, like this? I don’t know that I’ll actually do that, but anything’s possible. And if I do that, then that’ll leave me with just two white upper cabinets on each side of the wall of cabinets. Those will be the only white cabinets in the whole kitchen, which seems very strange and out of place. So that was my entire weekend. Second-guessing and always on the lookout for a better idea. I get myself so worked up and afraid to commit to an idea because something better might be just around the corner. And because I’m always looking and waiting for that something better, I never get anything finished! I went to bed last night thinking about how to incorporate white uppers and open shelves into my kitchen, and then woke up at 5:00 this morning with that same thing on my mind. And then at about 5:30, I realized what I had done. I had totally sabotaged my entire weekend because I had fallen back into bad habits, and had gotten so worked up about possibilities even to the point of it affecting my sleep. I got my eyes off of the goal (i.e., my “to do” list for this month), and I had followed rabbit trail after rabbit trail until my entire weekend was gone with nothing to show for my time. Anyway, today is the start of a new week, and I’m getting back on track. I’ve already received a phone call from the Benjamin Moore store telling me that they have my new gallon of paint matched and ready to go, so that was just the swift kick in the pants that I needed in order to get back to my goals. No, I won’t be getting new appliances right now. The white will have to do for now, because I want that money to go towards my studio. And no, I won’t be tearing out cabinets and replacing them with open shelving. That might look pretty, but it’s totally impractical for me. And no, I won’t be doing white uppers in my small kitchen. As pretty as white uppers are, I’m sticking with my original plan of all one color. And no, I won’t be doing a stained wood range hood cover. My small kitchen needs an integrated range hood cover, and I’ve already purchased the supplies for it. As far as that pass through goes, I’m still open to it. But that addition is still quite a ways in the future, so there’s no need to even think about it right now. So what’s my point in even sharing this with you? I’m not sure. I think I wrote this mainly for myself — to write this down in black and white so that I can have a reminder of it the next time I start to trail off on a path that doesn’t need to be my focus for now. It has been such a good feeling over the last two months to set (realistic!) goals and to actually achieve them. I really want to continue that path through the end of this year so that at the end of December, I can look back and see finished rooms filled with finished projects. I don’t want another repeat of 2016, where I end the year thinking, “What the heck do I have to show for my year? I got nothing done!” That’s not a good feeling at all. My Kitchen Remodel – Sources, Cost Breakdown, and the Grand Total! You’re honesty was just what I needed today as I am trying to finish up a house renovation, and too, am prone to going down rabbit holes! I’m refocused on the goals I need to accomplish to wrap up this project. Thanks! In my head, as I read the beginnings of your rabbit trail, I heard myself yelling, “NO! Don’t look! Stay the course!” But, you figured that out on your own. Have you thought about covering the refrigerator with wood to match the cabinets. Also, make sure your new freezer will go through the door to the pantry – I’m not sure the measurements of the freezer include the coils on the back. I always love whatever you choose to do. I must really be behind on your posts. I thought you did a green kitchen? And then I found the green kitchen impossible to decorate around, so I’m painting the cabinets a color that’s more me. I did decide, which I explained at the end of the post. Me, too!!! My pulse raced reading this because I so identify! It is so helpful to know I’m not alone and that you just have to kick yourself in the pants to get back on track. Loved this post!!! Thank you!!! I read the whole post and loved it! It’s exactly how my brain works!! You might consider that when you need down time but think you should be working your mind has you looking at alternatives to justify not working. Just a possibility. Thank you! I have been saying that for years. I think wood open shelving is a great idea – for your breakfast room. I’d do them on either side of your pantry doors and fill them with dishes, plants and maybe glass jars with baking goods in them. Good for you for realizing you were going down the rabbit trail before you started demoing more of your kitchen! We are in the process of fixing up the house to put it on the market. I wish we’d just cleaned and said this is good enough, but now we’ve started and can’t leave it half done. That said, I totally understand the rabbit holes. We, okay, I keep thinking that for only a little bit more effort or a little bit more money or time we could do XYZ instead of ABC. It is crazy when many folks are going to move in and make changes right away! This isn’t my home that I will be living in so why am I doing this to my tastes? I am trying so hard to keep going, keep working and just get it done! so we can move on to a smaller place for just the two of us (we have 6 adult kids so we have a way too big house) and make that exactly the way we want it. Second guessing and venturing onto rabbit trails are just ways of testing and confirming your original choices. Just a little meandering…that’s ok…helps you to refocus and keep your eyes on the prize. Carry on! Enjoying every bit of your adventures. Are you familiar with the book, “If You Give a Mouse a Cookie”? Yep, its your story. I was going to mention this book! There are a whole series of them. Another one is “If you Give a Moose a Muffin”. So funny. My kids love them! 1) I agree with the other commenter that the rabbit trail tests your commitment to your decisions. 2) I think your kitchen is too small for the open wood shelves and wood range cover. Also, the more that I think about it and the more that you have wrestled with different colored uppers, I think it’s better for you to stick with all one color cabinets, just based on the size of your kitchent. 3) Why are you even considering a stainless steel fridge if you hate stainless steel?!?!? You’re a goofball. That should have stopped you right there. 4) When you finish your family room addition, I do think you should blow out the top center of your cabinet wall, which is even more of a reason to paint them all one color now. Anyway, those are my thoughts, not that you need any more thoughts running around your brain! LOL! The reason I chose that refrigerator is because when it comes to refrigerators with no freezer (i.e., all refrigerator) the choices are kind of slim. And then when you factor in that mine has to fit inside the compartment (I need a specific width, but the height is adjustable), then my options are even fewer. I think I only found two that would fit, and both were stainless. One also came in white, but I don’t think I want white again. I’m just not sure, though. Don’t forget that awesome wallpapered frig. 🙄 Jus’sayin’! BTW, I love it, too, and I happen to share that same picture with my sister’s months ago. That was exhausting reading it but I totally get it. Lol! I’ve wanted Hickory cabinets forever and when it came time to remodel our kitchen we decided on vinyl plank flooring. The color and style I picked almost look like a hickory floor so it had a lot of movement in it and it would have been too much with Hickory cabinets, so I opted for Maple instead. (My husband lets me to have most of the say in our decor but he specifically asked for stained Cabinetry and not painted because he does not like it. It was fine with me because I like both styles.) Because of that same flooring I went with a different color Granite than I originally wanted. A few months down the road our vinyl plank flooring started separating at the end joints and we found out it was because they had changed their system. We got a full replacement on their dime and ended up getting a different color floor. Ironically the new color we got is darker and the original granite color I wanted would have worked just fine. I love my kitchen but sometimes I have some minor regrets but then I get over it again. The regrets seem to come when I keep surfing the internet. I plan to go with an “all refrigerator” at some point (when are current refrigerator dies). I haven’t spent much time looking at them, yet, as we’re a long way off from needing one. I’ve heard that if you look at commercial ones you can find good deals, but they will have all glass fronts. Unless you’re a neat freak, I’m not sure anyone would want an all glass front on their refrigerator. So, I’m thinking some soft of customization would be needed, like the wallpaper idea. 🙂 Keep plugging away! Why all fridge? Just because you won’t need the freezer portion doesn’t mean you hàve to replace it. Plus you won’t have water/ice if that is important to you or your family/guests (it would be to me). Also, don’t cave on the stainless. You will kick yourself down the road. Really, you will. Look into Frigidaire Professional series separate fridge and freeze. Depending on your size it may work for you. You could one in the kitchen and the other in your pantry. I have them and love them. I want an all fridge because we eat a ton of fresh veggies (and some fruit). Every week on grocery shopping day, I have a hard time fitting all of those veggies into my fridge. And I’ve noticed lately that I pack them in so tightly (because that’s the only way everything fits) that it cuts down on the air circulation and things get cooled so unevenly, and veggies at the back freeze. I just need more fridge space so that I don’t have to pack things in so tightly. Re #2: I have a small kitchen that I redesigned with open copper-clad shelves on one side of the room. That opened it up and made it appear larger. I had the exact sample thought! I do it too, and every now and again I have to sigh and tell myself to stop feeding the mice. I TOTALLY GET THIS!!!!!! This is EXACTLY what so often holds me back from ever starting. It feels like every decision has a snowball effect and I’m scared to move because I feel overwhelmed by the avalanche that may come. One of the things that has been so inspiring to me about your blog is that, yes, the snowball effect is real, and yes, sometimes a decision may lead to a problem that has to be worked out later, and yes, sometimes a project may have to be completely redone, but you are moving forward. And you have a lot more to show for it…mistakes and all…than I do, sitting frozen at the beginning, with my mind racing down rabbit trails. Bravo, Kristi, for getting back on track! If there is later a problem or something has to be reworked or redone, progress will have been made, and that alone is a success in my book! I agree with this! I have so many ideas but I am always afraid to commit because what if, what if, what if!! Before you know it, I have what iffed all over my house and nothing gets done. I have been obsessing about remodeling my kitchen for a whole year but the room is very unconventional and I can’t commit to a layout. My husband just shakes his head, I just lay out another design that I probably won’t use and we still have our crappy kitchen. Another thing I must say is that I can’t imagine having people from a blog giving me their opinions every day. I have had 4 different professionals come in here and completely second guess and talk me out of the decision I have made. Each one had a different idea and now I am once again at a stand still for the plan. Listen to your inner voice and get rid of the outside noise! The scary thing is that my mind works the same way. For years I have said that I’m a better “beginner” than a “finisher.” I think it’s the nature of a creative mind. Like you, I’m working toward a more disciplined creative mind. I LOVE reading your blog, and all of the inspiration it brings. Thanks, too, for a look into your thought process, this was a great entry. We are long lost twins! Glad you got back on track. In the future, when you look for a stand-alone refrigerator, maybe you can find one that can accept cover panels? 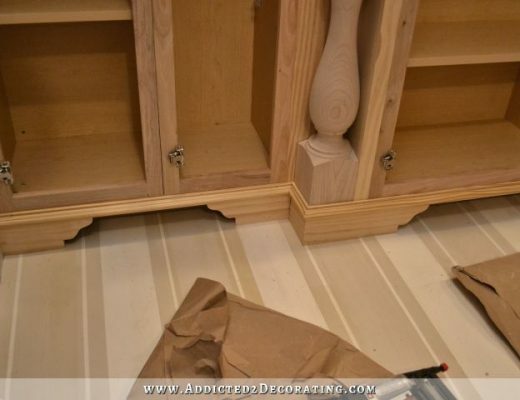 That way you can build a cover panel to match the cabinets and won’t have to worry about matching the other appliances. I’m so stressed out right just reading about your rabbit trail!!! Stay the course! PS I love your fridge!! We are building a new house and I have gone down some of those same rabbit trails. 🙂 I get started on something, then something shiny catches my eye, so I start in that direction and, “squirrel”!!! (my nephew yells that at me) We have a good giggle and my husband calmly says, “Focus. Just focus.” I’m glad you are back on ‘focus’ and realize that sometimes you just gotta chase rabbits… and squirrels. Good Luck! Stick with you original plan, it is perfect for you. If you want to add wood shelves do it in the breakfast room. I personally hate open shelving in the kitchen and think it doesn’t keep your dishes and cooking items clean and sanitary. 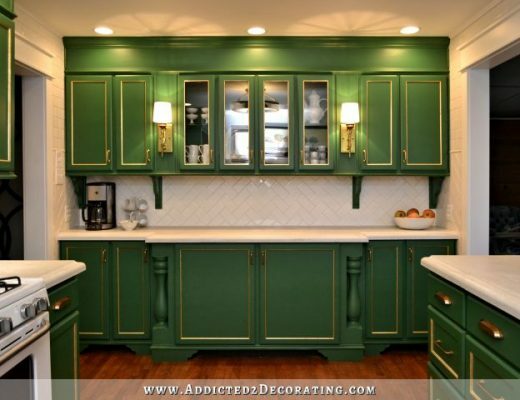 I loved your original green cabinets, but I get it, it didn’t work in the grand scheme of things. You’ve got a great design plan going, keep pushing through. Creative minds wander and we second guess ourselves and get distracted easily. I’m guilty of it too. 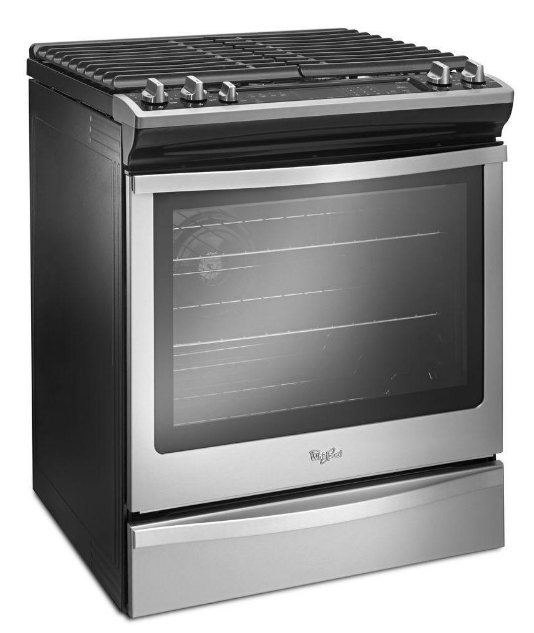 I personally like your current appliance pkg, what about a paneled refrigerator, when you are ready to switch out? Keep focused and you will be done with your list in no time! I am just as guilty, I do it all the time. I find that I really love the dreaming and designing phase so much that I am actually a bit sad when a project is finished because I no longer get to dream and plan the design of it any more. Fortunately there are plenty of projects needed at my house for me to work on. I think for those of us who love to design spaces the dreaming and designing phase is so enjoyable we are constantly redesigning the same space with thoughts of new ideas and possibilities. On our own houses it harder to commit to the design plan and not get side tracked with new options. Sometimes when I start to go down a rabbit trail mid project I have to imagine that my project is a project at someone else’s home to stay committed and focused on the current design plan because they want it finished ASAP. Oh, dear, I’m the same way. We are now finishing up our living room and kitchen. My husband said when we’re done, I’m going to have to stop looking at houzz and instagram and blogs, because I always see something beautiful and want to incorporate it into our home! Sometimes, I think, you have to admire something from afar and move on. How many beautiful things can one home hold! You have a beautiful home that will be just perfect for the two of you! PS. I don’t like open shelves in the kitchen-too hard to keep clean…but they sure are pretty. So glad you had the self awareness to realize what was happening! That’s a hard thing to do! 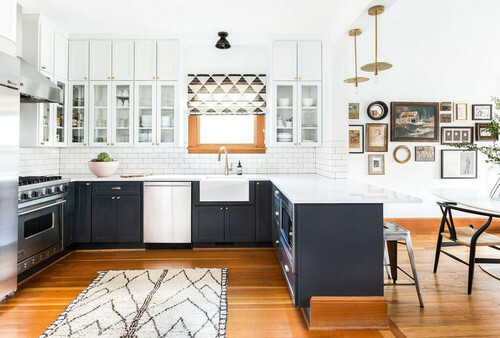 I agree with the others who think your kitchen is too small for open shelving and unless you are a total neat freak, items on those shelves are going to get greasy and dusty. 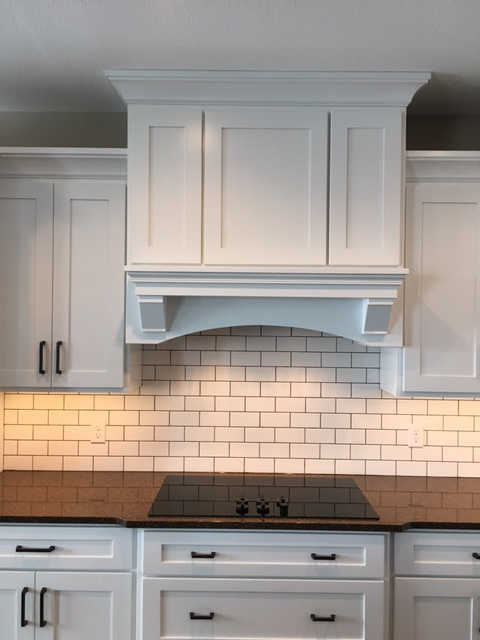 A single color kitchen with a painted integrated hood will look awesome! Try not to cram too many trends and features into your kitchen. I think your former dining room suffered from this and that it hard to decorate. Stay on the classic side and add details and trends with accessories that can be swapped out when you get tired of them. I can’t even read your posts anymore – it is insane and I wonder why I waste my time with this nonsense over and over again…..time to unsubscribe…this is not what I signed up for when I decided to subscribed to your blog….it is never ending…..
Wow, you are mean and negative. Dittos… I just kept thinking “poor Kristi, wait til she gets to be MY age… it only gets crazier and crazier!” She only goes round and round every now and then… Me? ALL THE TIME! LOL…On posts like this, it’s always easy to identify the people who didn’t even bother to read the whole post before leaving their petulant little tirade in a comment. And really, when you no longer find a blog useful or entertaining, there’s no need to announce your departure. That just makes you look silly and self-important. Just go. Can’t you just as easily guilty go away without being such a bully? Bye bye. Call someone who cares! We who have followed Kristi for a long time, get her! Besides, it’s her blog, you signed up on. Start your own! I will never understand why anyone thinks they should leave an unkind comment when they can just quit reading a blog. Help make the world a little kinder. I relate completely to Kristi’s “rabbit trails”. I also like that she isn’t afraid to make changes and shares her processes and doubts. I like to change things up in my own home every few years, but would love to change things up monthly. I think that is because my mom never changed anything. Different strokes for different folks makes the world more interesting. I hope you are treated more kindly than you come across in your comment. Oh my goodness, it’s OK! You have proven yourself more than able to deal with the “what ifs” – you just change it! You built the pony wall and then wanted to change it and you did. You painted the kitchen floor and then you changed it. So when you get a huge case of the “what ifs,” just know that (within reason) you can change it. A few lost hours do have value but less than $5000 in appliances. And some time in the future, the ideas and information you gained in the rabbit hole may come in handy. I’m going to add to my post and assert that Design Never Stops. I saw an episode of First Time Flippers that hit home. The couple were both on ladders, probably holding up each end of a piece of drywall or a beam, you know. And the design leader – the woman – starts talking about maybe they need a pendant light at the end of the hallway. The man got unreasonable angry at her for “not focusing” (when she was just acting as a prop for a piece of structure.) I thought to myself, that man’s attitude is just why people ask themselves “what was my builder thinking, why isn’t there a window here,” or “Why isn’t there a pendant light here?” I’m not even a designer and I never stop designing. When something looks wrong, I try to figure out why, no matter where I am. I want better appearance and better function in every condition. When I’m an old lady, I will be rearranging the rocking chairs on the porch. You will know that I am dead and gone because I will no longer be designing. I saw that same episode yesterday! I can’t imagine doing any kind of project and not thinking ten steps ahead. I guess it’s the difference between a creative mind and a stagnant one. I understand what you are going through. Some days I think so much that I don’t get anything done. My husband reminds me that “The enemy of good is better” and I have to let things go. Keep moving forward. You have made a lot of progress lately and it looks great! I inherited an old refrigerator for the basement of our summer cottage. I couldn’t pass it up since it was free and in would cost condition out I hated how it looked. I removed the handles from the door and glued plywood to the doors and sides. I then finished the plywood to match the cabinets and added new handles to the doors. I could not be more pleased with how it turned out. I spent less than $100 instead of $1000 for a new frig that I had on my list. I didn’t finish my comment above! Attaching plywood panels may be a “solution” for your new all refrigerator without getting all new appliances. I agree about the black appliances, i dont think you will be happy with them. On a side note don’t let the negative people get to you, you have hundreds of people who follow you & thoroughly enjoy your blog! I know you’re not replacing appliances right now but in the future, when & if you do, have you thought about getting a fridge & dishwasher that take a wood paneled front? It could be painted the same color as your cabinets. And you won’t have to deal with stainless. Thank you so much for showing us what it is really like to DIY. The process behind the actual reveal is what I come to your blog for. It’s frustrating for me to see other blogs where everything seems to go perfectly and then when I try it, nothing goes right and I have questions that never get answered. You answer those questions before you even get to the reveal. Thank you for your honesty and integrity. Kristi, this made me laugh the whole way! Sometimes I think I’m the only who does this! I’m halfway through a bathroom remodel, and I had completely stopped, because I couldn’t decide what to do with some hardware I purchased that didn’t match the other hardware. Do I spray paint it all to match? Two different tones? Do I return and keep looking, even though the style was what I wanted? So it leaves me in a rut, just waiting to figure it out, and then wanting to move on, or maybe go back and start from scratch. Sometimes I feel like Houzz and Pinterest are too distracting–especially when you have the skill to replicate something you like, and then how do you ever say, no, I’m content! I’m not laughing AT you, I’m laughing WITH you. Been “planning” the master bath remodel off and on for 6 months. First choice of solid surface not available in large format. Got sample of “it will sorta work” (added it to box overflowing with other samples), then searched for coordinating hardware. BAM! Hardware is way too costly in the finish required. (Soft sobbing.) Back to internet, determined to make my FIRST CHOICE work no matter what. Why do we do this to ourselves? Upside…I now have tons of solid surface drink coasters. So funny. I do that too. Then have to stop myself & go back to where I glimpsed the “sparkly thing”. I’ve not been a subscriber for long, but I already know you’re on the right track with your teal kitchen. Can’t wait to see it. Ok. I loved this post because I can identify. I also think I take myself down a rabbit hole when I am trying to avoid a project that just isn’t fun, or is hard, or has me stumped and I’m not sure exactly how to fix. Kudos to you for getting yourself back on track. I have to say that one of the things that used to stall me was looking at all the blogs and shows and thinking: “they manage to get it all done, 1-2-3! There must be something wrong with me! Why can’t I just decide on something and make it happen?? ?” So, I find your posts like this or the ones where you describe your thought process for un-doing something you did wonderfully the first time SUPER helpful. I envy people you settle on an idea and make it happen and never thing twice or look back, but we’re not all like that and I’m very glad you’re willing to share this “human” side of yourself. It’s very empowering! You have plenty of posts that are “here’s what I did and here’s how I did it.” What makes your blog unique and valuable are posts like these. I find them just a powerful in helping me get my house where I want it to be. I want to thank you for today’s post. You have made many of us feel like we aren’t crazy. Love your comment & would love to see pics! I totally understand, Kristi. When anything is a possibility, how do you NOT go down rabbit holes? I applaud your ability to get re-focused at the end of it all- good job! I think I would be exactly the same way. You’re passionate about your home and wanting to get it right- that’s why we love watching you! Honestly, I’m embarrassed that I can relate but that’s what makes us special. I enjoy reading your journey. Feels good knowing others have the same struggles. Keep going, Kristi! Stay on your original path. Try not to second guess yourself. I know it’s easier said than done. Thank you SO MUCH for writing this post! I am doing a substantial refresh of the master bedroom. It took me FOREVER to choose a paint. I looked a million paint chips–all grey hues–before I decided on which one. My idea solidified when I found the comforter and pillows, but I agonized over every detail of the room. I was giddy as I rolled on the first coat and waited for it to dry. And I hated it. It was more blue than grey, so back to the drawing board. I’ve been to the BM dealer here and she was a tremendous help. I came home with more paint chips, thinking I would have to paint the room taupe for it to look like the grey in my mind. The actual planning process takes way more time than the actual work. I’m glad I’m not the only one who takes decorating side trips! By gum !I read all and started to panic. But smiled at the end and thank goodness the paint man rang you. Glad that you are sticking with your original BEAUTIFUL. Plans. Keep to your plan Kristi! I loved this latest post and i also enjoy all your posts. I admire your skills and outcomes. I felt like you endearingly and honestly described what i, and apparently quite a few others, sometimes experience. If you don’t explore, how do you discover? You spent a couple days exploring. Call it exercise. If your discovery was something in the self-awareness category, that is a life goal we all share. My opinion is for you to keep examining and also remember your good schedule. They are not necessarily exclusive. You are irrepressibly creative. That’s a good thing! WHEW! I don’t think I could have fallen asleep with all that in my brain! My head was swimming just reading the rabbit hole! But I do get how we can go there. I’m kinda doing it now while my husband builds walls in the basement. We’re finishing it off with two bedrooms, a full bath and family/game room. Every day I come up with an idea and run it by him. By the time I’ve verbalized it to him, I ultimately nix the idea (to his relief!) Time is our friend, sometimes. We just need to slow down! You could always make your appliances go away and put cabinet doors on them (at least the stove and washer)! OMG I think we must be soul-sisters. I do the same thing, and then have a Monday Morning Reality Return. Thank you for posting this: I am saving this one to refer to MYSELF, so I can (maybe hopefully) get back to reality quicker. Kristi please do not get black appliances! We had a black stove that came with our house and it was horrible. Every speck of dust showed on it and I felt the need to wipe it down multiple times a day! I can totally relate to the rabbit hole! I second guess myself all the time and have a hard making the final decision. Pinterest can be a curse! Anyway I love the paint decision you made for the cabinets and I am dying to see them painted. Can’t wait! Kristi, I am in the camp of those who appreciate you and your talent to the highest level. I must say one word – Adderall. This only gets more prominent with age. Seattle Sue I second your post & thanks for a great blog Kristy! We too are looking into ditching our fridge/freezer combo for a full height refrigerator. We also put our deep freeze in the pantry so no need to have one in the kitchen. I’m surprised more people don’t go this route which leads to the poor selection for full height fridges. I am confused when you said you need a new freezer. Didn’t you buy a deep freeze for your pantry already? I wouldn’t think they’d need to match since they are in different rooms. Your mind is so open to ideas that I’m sure it’s very easy to get derailed. You are good about keeping those ideas for future use, so it was probably not a bad thing. I’m sure your current appliances will be fine for a while. Personally, I do not like stainless steel. They are hard to keep smudges off. I prefer white but that’s just my opinion. Not sure how I feel about black appliances with teal cupboards but it might be pretty nice. Just don’t know. I know I can’t wait to see your cupboards with the teal paint on them. Good luck getting them painted and another thing you can check off your list. I know I’ve already replied but wanted to add this: your ability to see all the options is what makes you a talented designer. It would be easier if you were doing this for a client but since it is your project, you doubt yourself. Go with what you know, as you did when you finally selected your new kitchen color. And, if in the end that doesn’t satisfy, change it. It is your home, not anyone else’s. It will be amazing, in any case, just as the now discarded green kitchen was and the new color will be. Well, certainly at this point in your life, there are certain personality attributes that are going to remain forever and just need to be accommodated. Gosh at my age, I’ve learned enough about myself that a project doesn’t begin until I have a rather definite course of action. And during the process I only give myself maybe 2 options (brass or antique brass for instance) decide by overnight and never look back. Never look back. Decide to go forward with something if you can live with it for 20 years, with the knowledge that something better will come along but this item is yours for 20 years. Make solid choices and stand by them. You chose Matt, you know how to make a solid choice, just make sure each choice is solid when it’s made. Always remember, there will always be something better and you have solid reasons for the choice you are making. Then, do it, stick with it, move on. (nothing is etched in stone but for a semblance of order once you have a plan-make sure it’s not an iffy plan, and then proceed.) You need to pop a melatonin and dream real dreams. I think this is a brilliant post. To see your train of thought on possibilities and then to come to the conclusion is exactly spot on. What I learned from this is that I need to record my considerations so that I can see the trail that will lead me to the answer….even if that answer is to stay the course. Without recording this as you showed, it’s just a boatload of WHAT IF options that keep on running in and out of my mind/room without being told to just “sit down and wait”, or “just leave”. THANK YOU KRISTY and all the best on this kitchen journey!! Gosh, I never thought of it before, but there’s real freedom in limitations, and the ability to do anything can be a burden. I think there’s something in the Houzz and Pinterest photos that draws you away from your own self and desires. It’s natural – we’ve all been conditioned to aspire to what they illustrate. But one weekend of looking at photos made you begin to turn away from everything you’d worked so hard to choose. Don’t give them the power to doubt yourself. Only recently starting following but I love this post, so refreshing to hear that others are exactly like me! I have so many unfinished projects because I am scared to commit…….not only that I’m also the same when making decisions and checking and re-checking, spending hours online to make sure I find exactly the right product! Looking forward to seeing how it looks when it’s finished, I am sure it will look fab! I have a question about your counter top. Can you put hot pans from the oven directly on them? My current counters are at least 50 years old, but I can put hot pans on them with no damage. I want to replace them, but I’m not sure what to use. I can, and do it all the time. Kristi, please show the steps to building the new range hood. I plan to build the same style, minus the doors also. If it makes you feel any better, I do the SAME thing!!! You still get a LOT more accomplished than me, and no doubt many more of your readers. Now I don’t have an unfinished house, but I have plenty of other projects that I get sidelined on more often than not. Wish I could snap myself out of it like you do.